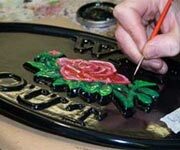 The Sign Maker for the very best Signs & Memorials :- Beautiful signs, plaques and business signage. High quality signs and memorials to suit all budgets. Huge choice in materials, fonts and images. Also a massive range of standard safety signs, posters and equipment. 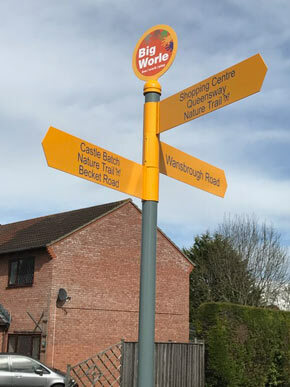 Do have a look through the links below - we offer a huge variety of signage! You can place orders by phone, email or via our online shop. 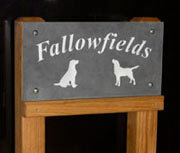 Our Slate Signs House Signs can be cut to any size including some rounds and ovals. For house name plates we also have granite and marble. They can be painted in a variety of colours or the background can be blasted away leaving the letters raised. Depending on font and design, slate can look traditional or modern. 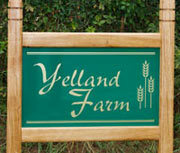 Each wooden house sign or large wooden commercial sign is made to order with a huge variety of fonts and sizes. We can also include borders and pictures. Lettering is also painted in a choice of colours. Oak is the most popular wood for a sign . However we do use Cherry, Sapele, Iroko and Cedar. Rustic slices are also produced. After years of signs with vinyl lettering the painted sign is making a come back. We can use solid oak or we can paint a board known as Tricoya - this a wood based board made using a high performance resin. It is very stable, durable and weatherproof. Tricoya itself comes with a 50 year guarantee. We also frame the Tricoya with oak for a traditional painted framed sign. Every house name plate is unique. We make them just the way tou want them. You choose the size, the font, the shape, the layout along with images and a border if you want one. 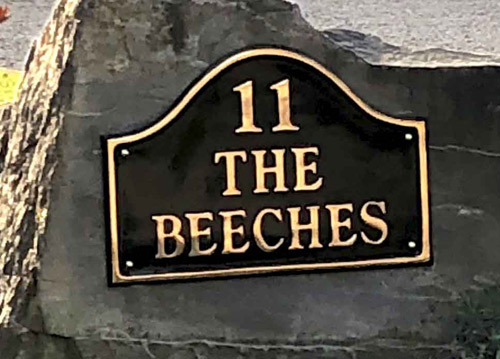 We make house name plates in many different materials - engraved brass, cast brass, a range of timbers, slate, granite, aluminium, corian, bronze and others. The choice is yours. These are made in self adhesive vinyl and rigid PVC in both white and photo luminescent. There is a huge range of standard safety signage including fire, warning, hazard, safety posters, food safety, water safety etc. They are all on the web site and we do have a fantasic catalogue for the safety signs. Give us a call and we will send you one ASAP. The cast metal signs are all made in a foundry using traditional methods. They are all long lasting and hard wearing. 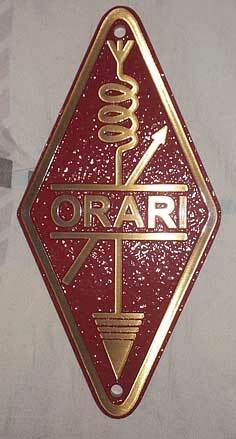 House signs are available in Cast Brass, Cast Bronze and Cast Aluminium. 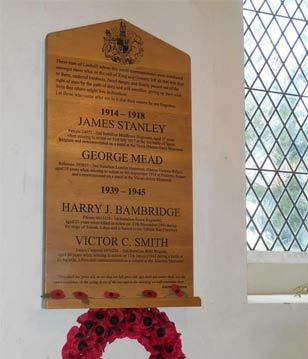 Memorial plaques are available in Cast Bronze and Cast Aluminium. A range of boards are available for all purposes. Ideal for information boards, business name plates and house signs. Can be made with singe colour cut vinyl or printed full colour or a mixture of both! Supplied with or without frames and/or posts as required. Reflective nameplates along with good range of fibreglass sign boards. It is really important that your Entrance Sign looks the part. It is not there just to identify your property, although it does of course need to do that. 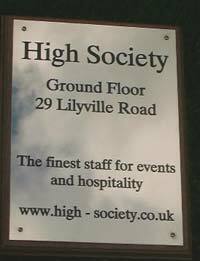 As people drive past they see your entrance sign and will unknowingly judge you or your business. 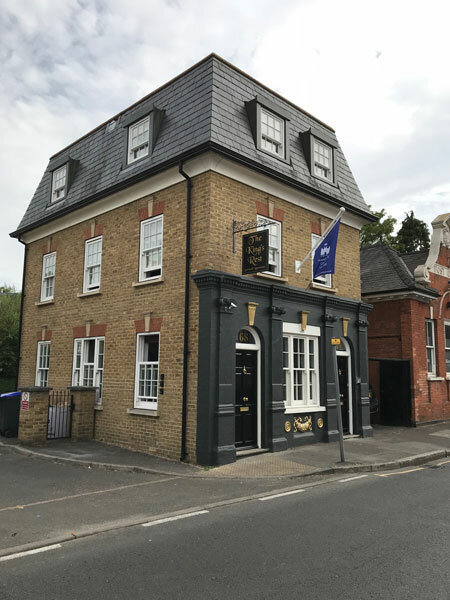 We have put together a selection of links to various pages of the website, which should enable you to find the right entrance sign to suit your property or business and your budget. We have a superb range of outdoor notice boards and poster cases which are all secure and waterproof. Included in this range are shaped notice boards and menu cases. Also indoor notice boards, A-Boards, Blackboards and White Boards. 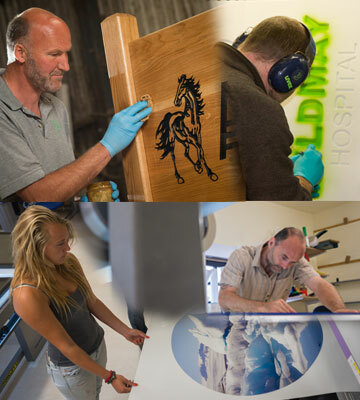 We make the horse name plates for stable doors in several materials - three different timbers, engraved brass, acrylic laminate & aluminium, stone-like corian and a cast metal alloy. Each casting creates a unique piece in it's own right. Craftsmen use traditional methods for casting the bronze plaques and ensure that every handmade bronze sign or plaque that leaves the foundry is absolutely perfect. Background colour include black, brown, blue and green. Over the last couple of years simple black and white signs have become very popular. We have therefore created a page to show the various alternatives available to you for a black and white sign. High quality contemporary acrylic name plate suitable for internal or external use. They look crystal clean like glass and are ideal for a modern look. Also available in larger sizes for business. Full Colour designs also available. A varied range of metal signage suitable for house signs, memorial plaques and commercial signage. Metals range from enamel plates to full colour printing into anodised aluminium, vinyl lettering and full colour vinyl on aluminium plate, hand painted metal, engraved metal and cast metal. A modern material with a cold stone like finish. It is perfect for signs in that it is very durable, fade proof and virtually maintenance free. Can be supplied as it is, on backing board or with oak frame. Also available as a two tone plaque with invisable fixings. We can make all kinds of wedding signs along other wedding paraphernalia. 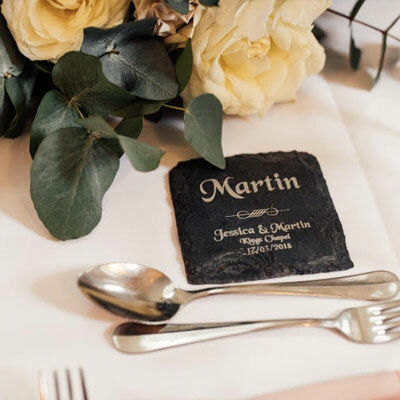 The rustic slate place name settings are very popular indeed. 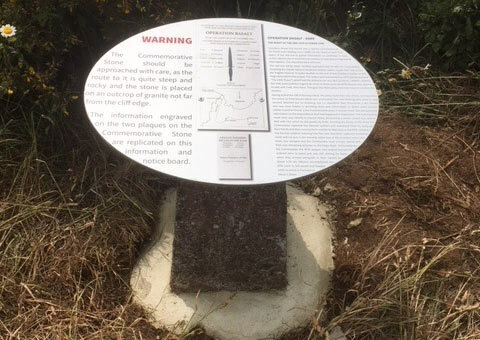 We also have directional signage, banners, sand blasted jars, picnic benches, magnetic signs and more. Custom made wheel covers in both semi rigid vinyl and stainless steel wheel covers. 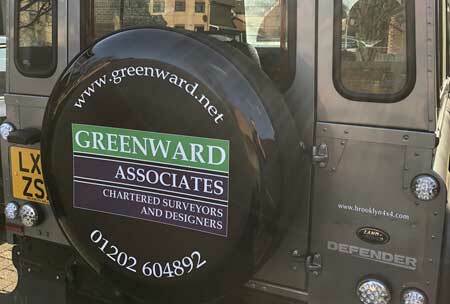 Single colour designs can use reflective vinyl. At The Sign Maker workshop our carpenters can make virtually any taxidermy shields or trophy plaques in any of our timbers and to almost any shape and size. We do not use veneer! All the plaques, shields and bases are solid timber, with oak being the most popular. There is something here for everyone. This light weight metal signs are the perfect inexpensive present - ideal for Mothers day, Fathers day or a birthday/ Christmas present. On the other hand perhaps you may want one for yourself - i.e. Kitchen Rules would be handy in most households. All our personalised gifts are well made and we know you will be very happy with them. 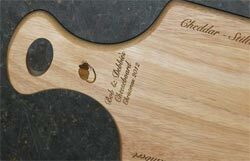 They include a large range of chopping boards, bread boards and cheese boards all engrave with your special message The oak photo frames are made to order in our workshops and can be laser engraved with your words. Our craftsmen who sand blast the stone signs can also sand blast other items. 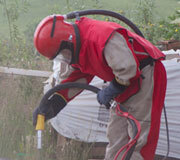 They can sand blast anything, from bike parts to garden chairs and bread oven doors to old tractors. Builders often bring in new oak beams to sand blast them adding a bit of age. We also sand blast timber to create for a driftwood effect. We are giving away Personalised Cheese Boards! One for every new 100 likes on Facebook. To be in with a chance, just click the Facebook Like link below. The Home Page Galleries Whats New? We receive lots of lovely thank you emails from our customers - here are some of the latest. I received the sign yesterday and I am extremely pleased with what I received, please pass on my thanks to the team. I’d also like to commend you on ensuring the delivery was in the very tight window I gave you, once again thank you. My only regret is that I don’t have a need for more, rest assured I will return if the need arises. Just wanted to say thank you for the house sign which was made by yourselves I am really pleased with it. By the way I thought you might like to see what happened to the last plaque we purchased from you. Needed a distinctive enamel sign for our cottage earlier this year and was extremely pleased with the result which attracted quite some favourable comments when up. Recently ordered a sign to indicate parking area and again the result was excellent. Web site is easy to use and Customer service above average. Would not hesitate to recommend products and service. You are very welcome ,I do not do Facebook or any of the others, so will ,when have time, write a review and pass word that your company is one of the best I gave dealt with, and as a business partner in a large farming company who deals with many staff and many companies this is not a Nothing praise. I wish you and your company well for the future ,you deserve the recognition. I ,may be in touch with you in the near future, as the farmhouse sign needs replacing, and have no reason to look elsewhere. 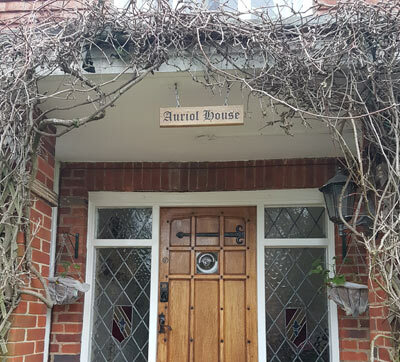 Just a one-liner to confirm the house sign arrived safely yesterday. It looks wonderful. Fully up to my hopes. Please give my thanks to your team. As per our phone conversation last week, I've found everyone I've spoken to at Sign Maker to be very helpful, understanding and totally professional. Normally most people would have grown impatient with the number of proofs I've requested. But at no point did anyone give me that indication. Also you've all helped with your recommendations and advice which I really appreciate. You kindly organised the tree plaque I ordered in memory off my parents (surname de Beaufort-Suchlick). It arrived today and I am delighted with it so very , very many thanks indeed. You were exceedingly helpful and informative and I much appreciated your assistance - the plaque looks lovely and is just what I wanted. I just wanted to say that the coasters I ordered for my wedding 3 weeks ago were absolutely stunning! I had so many compliments from the guests and they really did look amazing on the tables. I have attached a photo of the decorations so you can have a look. Thank you so much to you and the team for doing this, I wouldn’t hesitate to recommend your company to everyone! We received my sons refurbished plaque today, just as you promised. The sign is first class and screws did the job. I attach two photos which you are free to use in any publicity should you wish. Wonderful signs just arrived ! Just what I was hoping for …….. pics will come when installed on site. I had to write to say that the sign was delivered today and I am absolutely delighted with it. Often firms promise the earth and it’s not quite that on delivery, in your case, if anything, it’s the reverse - absolutely stunning. Just to let you know that the post and sign I ordered have been delivered safely today, complete and undamaged. I am delighted to finally receive them! They are beautiful! Many thanks for all your help, advice and prompt remaking, it is much appreciated. Please thank all staff involved. Just to inform that I have received it. I love it and I rightfully proud of it. Very satisfy and friendly, I have seen this from the beginning. Please accept my regard and extend to your product team. Just a quick message to say thank you SO much for the hearts they are marvellous. You were all so helpful and efficient. Whenever I have the opportunity I shall recommend you - I promise! I’ve just got to attach 100 ribbons now! Thanks for getting there on the delivery of the sign. It added a genuine touch to our Georgian property. "Please do send my thanks on to everyone involved, and a big thank you to you for persevering with this as I know there was lots of faffing in the beginning! 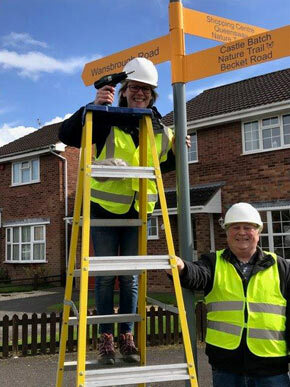 Thank you to you and all of your team for all your work on this project, the signs really do look AMAZING. And from a logistical point of view, THANK YOU SO MUCH for packing them with the relevant labels and location numbers. That was a god send today when we were driving around and installing them from the back of my car! Your team really have done a great job and please pass on our thanks. Hopefully we will get Phase 2 authorised later in the year, I will definitely be back in touch. The quality of the signs and the service was fantastic. Best wishes. 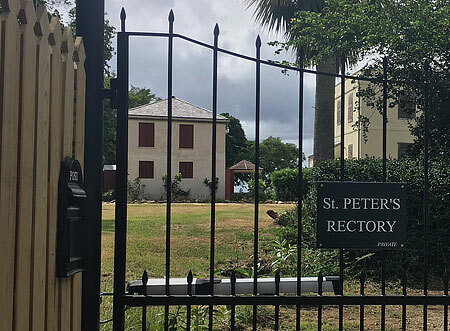 Vicki"
Just to let you know our sign arrived safely and is on the gate. Many thanks for all your help, please pass our thanks to all the team. I wanted to send a photo of your finished sign in place. We had the unveiling on Sunday at a special service in our little church. Many of the relatives of the fallen attended as well as many parishioners. We really are very grateful for all your hard work and patience to make such a wonderful memorial, I’m happy to say everyone was delighted with the quality of your work. In the end we mounted in such a way that you can not see the fixings. My name is Sophie Pendry, myself and my friends ordered a plaque from you a couple of weeks ago in memory of our friend Dan Hougham who was tragically lost in a car accident 7 weeks ago. I wanted to take the time out to personally write you a letter of thanks, We were absolutely over whelmed by the finished result as it's exactly what we were after. I can assure you so many tears were shed upon only showing Dan's Friends before our event on the 31st July to unveil it's new home to the family and the rest of Dan's Friends. I physically can't thank you enough for getting every detail spot on with this and it's meant the world to all of us. The process from start to finish was as simple as anything due to your wonderful team. Your service is impeccable and i didn't have any doubts when ordering this. It's been extremely hard for all of us losing Dan as he was essentially a brother to us all. Thank you for every phone call, every email and every proof it's all perfection. I know it's not much but from the bottom of all of our hearts we thank you all for making our dreams come true and giving us something Dan deserves more than anything through his honour that we can visit forever more. We can never be more grateful.